Moneyball might be top of mind for most teams these days, employing the most sophisticated analytics technology to get the most out of each athlete, but this is often not the case when it comes to getting the most out of each fan. 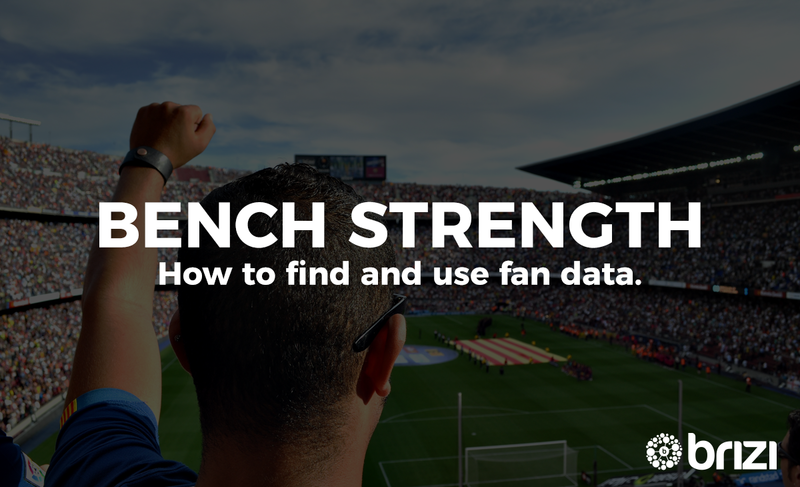 Effectively collecting and interpreting timely fan data is the secret to driving brand equity, sponsorship, concessions, merchandise, ticketing, media rights and much more. With emerging forms of media and other experiences becoming more compelling than ever, rights holders should know better than anyone that any good team lives and dies by its fans. Our team at Brizi spends a lot of time looking at fan data and we are always surprised when we hear from new clients that they want to have strong fan data capability but don’t always seem to know what to do with it. We decided to spend a little time and share some of our thoughts on what sort of data is available to sports teams, where to find it, and what can be done with the data as technology permeates deep into sports & entertainment. Data friction is the effort spent to collect and use data for your organization. The rule of thumb when collecting data is that often the more depth you want, the more friction you need to introduce to get it, but technology has begun to flip some of these assumptions on their head. For context, an on-site survey about an event can be costly to execute because it requires the guest to pause the experience they like for one they’d rather not participate in. Prizing & contesting can help reduce the perceived friction of the collection activity for fans, and have other goals, such as a better fan experience, partly subsidize your fan collection activity. On the other end, buying data from a third-party database, usually collected from other sources, is nearly frictionless, unfortunately this data is not timely, significantly reducing its value. 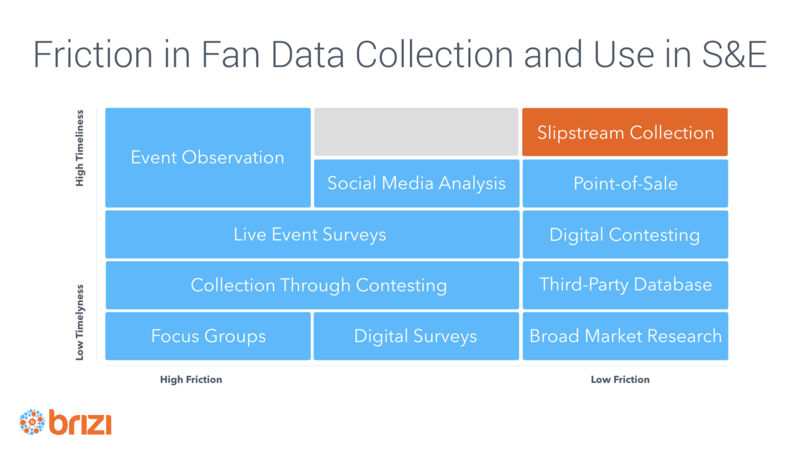 Below is a helpful chart in thinking about fan data friction as it applies to data timeliness in sports & entertainment. We call the next generation of data collection and insights generation slipstream collection, a way of collecting highly valuable and timely data in a nearly frictionless way using modern technology. We think Brizi technology fits this philosophy, fans do what they love, and we get to learn about them. We are able to identify identity, demographic, primary interest, journey, and affinity data, alongside social media performance data all to help teams craft a better experience for fans, and to help sponsors get more out of each event. A win-win-win. Arguably the lowest hanging fruit of fan data use is targeted messaging. In the same way that mass customization in manufacturing is revolutionizing everything from commerce to health, we are now starting to see customized, targeted, messaging make users feel that they are having engaging personal conversations instead of receiving impersonal spam. The value is clear, tailored messaging to the right people at the right time is an effective way to drive ROI. Pulling from our own playbook, after a game, we are able to send an email to the event goer (even if they weren’t the one who bought the ticket), put their favorite athlete in the header, and tailor a targeted offer from one of the sponsoring brands depending on their affinities. This is a highly effective category of outreach that was previously underused due to poor fan data. Outside post-event marketing, there are many other ways targeted messaging can be employed, in particular anytime context is helpful for a guest interaction. A guest passing by a concession or merchandising POS can be directly notified of an interesting product or opportunity, a sales person can be informed when a specific customer is nearby, or a customer facing a particular scenario can be sent immediate help to avoid a poor experience. Still considered the holy grail of marketing, actionable feedback is being able to respond to customer concerns or other signals in real-time. Currently, a market research company can come back to you within a few months, or a self-deployed feedback kiosk can get you results in weeks, but nothing beats mobile in being able to provide data in real-time. The challenge today is not necessarily in collecting the right data, rather, it’s in the speed of interpreting timely data, and providing it to the right people in your organization for them to action it. Take the example of an unhappy stadium guest who is frustrated with a 10 minute washroom line, they might express their unhappiness on social media, or if you have the channels, to your team directly. If the customer-service team on the floor knew about this guest, they would not only know that people around him likely have the same problem, they could also act immediately, such as providing directions to an alternative section where there isn’t a line, or at the very least acknowledging their frustration and diffusing the situation. Good systems for actionable feedback also provide a much more important capability that is often overlooked, follow-ups with churned customers. Continuing with the washroom line example, if this customer is always frustrated by this issue, they may choose not to come to future events. Knowing the reason behind customer churn can allow teams to target them after a change in the experience to communicate the improvement, and win a customer back. This personal touch is not only highly effective, it helps overcome major areas of churn. Predicative analytics is going through a renaissance with technology companies. In essence, predictive analytics is simply using statistics on large data-sets to make predictions. What this means is that you can use past data to inform better decisions that improve the game-day experience, drive renewals, ticketing, concessions, and more. Those part of large multi-sport properties can take for granted that there is a lot of comparative data available between events, but for most, such data is precious. Simply comparing one property to another can help teams understand how effective operations, concessions, promotions, and sponsorships are performing. This is an effective data-driven way to learn from others, borrow what works, discard what doesn’t. In chatting with the Australian Open team, we learned that a big part of their strategy involves simply visiting other events globally to learn from them. This kind of approach can be daunting, time consuming, and expensive. Here is where a technology company like Brizi can add a lot of value. In our case, by operating across some of the largest properties in the NBA, grand slam tennis, and now soccer, our team is able to compare and contrast what works and prove it with hard numbers. Our customer success team has built a powerful promotions playbook that can help even the most seasoned sponsorship or game-day operations professional learn a thing or two. If there is one take-away, it’s that fan data gets wasted. Sports and entertainment properties have lean teams, and there is often one person responsible for pulling all the data and coming up with recommendations, this is not sustainable. With the help of modern technology companies, having specialists in every segment of the business to make decisions on the back of timely data is an achievable dream today. The importance of data cannot be understated, and there’s a lot more to come. One thing that we think will be big in the near future, and something that we’re spending our time working on, is the deep mining of visual information. What we mean by this is the ability to extract information from imaging data. This can include measuring the impact of competitive sponsorship by looking at what logos are visible on fans, confirming buyer behavior, measuring sentiment, confirming demographics, measuring in-seat duration, and so much more. Making the right decisions around fan data can be overwhelming, but it doesn’t have to be this way, we’re right around the corner. Brizi lets anyone tap into nearby cameras to capture group memories at iconic places. We’re deployed in 7 countries, working with organizations across NBA basketball, European soccer, and Grand Slam tennis to deliver an authentic high affinity sponsorship asset that captures fan insights.